I love ginger and my dad loves ginger. And, as my mum says, I am my dad — so much so that she sometimes calls me Jackie (dad’s name is Jack). My daddy is no longer around in body but in spirit he’s always with me and so this Father’s Day I’m baking something sweet in his honour and to thank him for being a "no holding back" recipe taster since I started cooking at 9 years old. Ginger is a wonderfully medicinal spice: anyone who suffers from nausea/travel sickness can testify to its immediate effects! It’s stimulating and warming — brilliant for Kapha and Vata types — but should be eaten in smaller amount by Pitta types who often feel hot and irritable. My dad loved a ginger biscuit, so I created a crunchy ground almond recipe to mimic his favourite biscuit in The Art of Eating Well, which was published the year he passed. 4 years later and I’m thinking another ginger bake is in order. Since I’m out here in L.A. where "cookies" are de rigueur, I decided on a softer biscuit and came up with this cookie with an Ayurvedic twist. Chickpea flour — also known as gram flour or besan in Hindi, Urdu and Burmese (you usually pay more for anything called "chickpea flour") — is a popular flour in Ayurvedic and Indian cooking and is often used in sweets. You can pick it up easily in most of the bigger supermarkets and definitely in local Asian food shops. It tastes like grass when it’s raw (because that’s what a raw chickpea tastes like too), but when toasted to make ladoos and barfis (traditional Ayurvedic/Indian treats), it becomes a deliciously nutty protein-rich flour, which is an added bonus for those who can’t eat nuts or eat too many — plus it’s 8 times cheaper than a bag of almond flour the same weight! Adding ghee and jaggery keeps the Ayurvedic inspiration, and a flax egg makes a great option for anyone who doesn't eat eggs, plus keeps it fun — who would have thought some ground flax and water would work just as well in this kind of baking?! The biscuits use spices both for flavour and to aid with digestion, as each one has different properties. Here I added cinnamon and cardamom (I would have used nutmeg but didn’t have any on me) as well as plenty of dried ginger (feel free to add in some fresh in there too) and a little more kick from cloves. If you’re in the U.S., feel free to add in the equivalent spice amount in Pumpkin Spice, something we can’t find easily in the UK. The cookies are flavourful, so if you like them a bit more mellow adjust the spices and taste as you go. 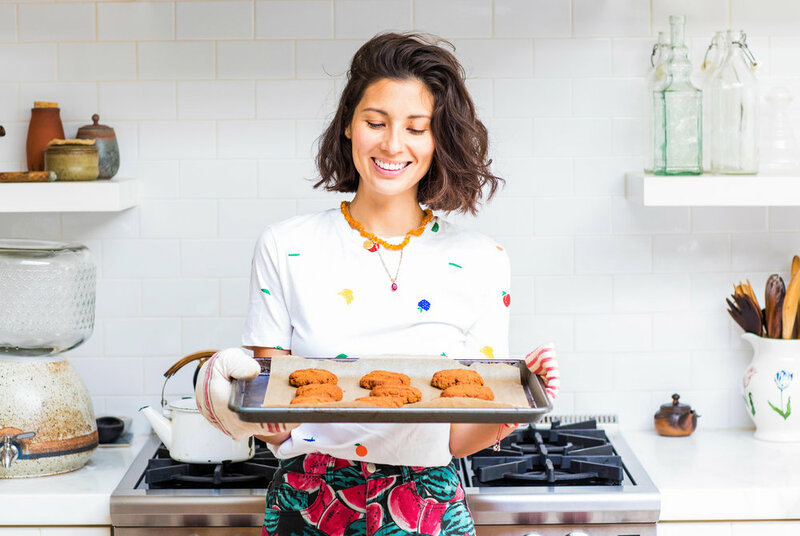 Unlike making a cookie dough with raw chickpea flour you can really taste as you prep... in fact you can just go ahead and enjoy the raw dough if you like! Meanwhile, it’s worth adding that these guys are naturally gluten-free, and that you can make the batter in advance and bake as you go for fresh cookies. Because I’ve used a flax "egg" (feel free to substitute a real egg) and because you can swap the ghee for coconut oil, these cookies are great for vegans too. Phew — I think that’s just about everything I have to say about these, other than THEY ARE DELICIOUS. And you’re very welcome, ha! Soft, chewy gingersnaps made out of chickpea flour, which makes them naturally gluten-free and also nut-free — a lovely way to change things up. Require at least 1-hour chill time and are best enjoyed fresh. Mix the ground flax and cold water together in a small bowl. Allow to sit. Toast the gram flour for 15 minutes in a dry heavy-bottomed frying pan over a medium heat, stirring frequently to ensure even toasting and to keep the flour from burning. At the end of this process the flour should be fragrant and a few shades darker. Remove from the heat. Allow to cool a little, then start to add the rest of the dry ingredients. Mix well and then stir in the ghee and flax egg, using your hands to mix in well, adding 3 tbsp of water slowly to form a dough. Taste the dough and add more ginger if necessary. Roll out 9 walnut-sized balls of dough. Place the balls on an ungreased baking sheet and press down so that the cookies are about 1 cm in thickness and chill for an hour for best texture. Bake for 20 minutes or until lightly toasted on the edges. They will still be soft at this point but will harden as they cool. Let the cookies cool for 5-10 minutes before transferring to a cooling rack. They are best enjoyed fresh. When completely cool, store in an airtight container.